Well, this is weird. I have been buried, working until 4 or 5 in the morning every day trying to get my next batch of Axe Cop comics done. In the scramble I didn’t even realize that I had skipped a page of the story. I think it made sense with out it, but you get a little more details with it. So this page was supposed to post right after Axe Cop and the Water Queen go to Jauber Willer to let him know they are getting married and they revise the invites (episode #183). I’ll post this as a new page for now, then in a week or so I’ll have Doug S. reorder the page where it belongs, because I have no idea how to do that. This actually worked out, because I noticed I did not have the colors for today’s page due to an upload error. So here you go… the missing page! 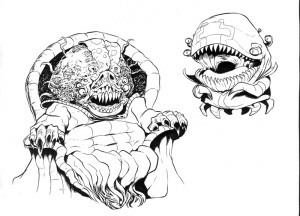 I know that you read one or two pages per week, so maybe you forgot about the scene where Jauber talks about how they are trying to create an evil planet but they need to supply it with water somehow. Well, that happened, and that look Jauber and Zelda are giving one another is why. I know I shouldn’t have to explain this, but I think if you read the comic all at once it will make more sense. I think if you read updates as they come you may miss that detail. That wedding invitation up there is headed to your home if you ordered anything from me on the Axe Cop Wedding campaign. I just dropped all that stuff off at at the post office yesterday. I apologize for how long it took, but it feels so good to basically be done with that. 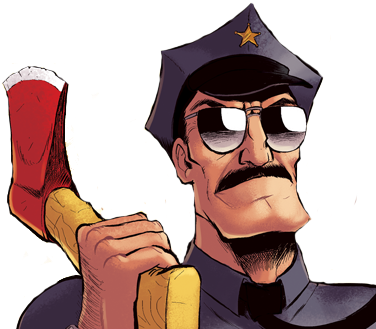 Did you see Axe Cop on Saturday night? I love this episode, it is so much fun. It’s very close to the original source material: Axe Cop Babysits Uni-Baby. We swapped some characters around, but content wise I actually like this execution better than the original. I think Sockarang is hilarious as Axe Cop’s side kick on this adventure, and since the Uni-Family hasn’t been introduced into the TV show yet, Flute Cop and his wife are great as her adopted parents. I voiced a character in this episode. Can you guess which one? Next week is an episode I haven’t even seen yet. Bad Santa! I’m looking forward to it.